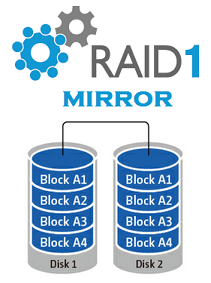 In RAID 1 (mirroring without parity or striping), data is written identically to multiple disks (a "mirrored set"). While any number of disks may be used, many implementations deal with only 2. The array continues to operate as long as at least one drive is functioning. With appropriate operating system support, there can be increased read performance, and only a minimal write performance reduction; implementing RAID 1 with a separate controller for each disk in order to perform simultaneous reads (and writes) is sometimes called multiplexing (or duplexing when there are only 2 disks).